Woorabinda, along with Stirling Park, was originally known as ‘Halliday’s Gully’. 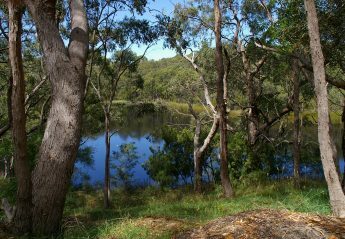 It is just over 10 hectares, and contains a man made lake and extensive bushland. You can take a self guided walk around the lake and the top of the Aldgate Creek. A brochure is available to help you make the most of your walk. Woorabinda Lake was originally constructed by the South Australian Railways Department in 1922 to supply water to Aldgate station for use by steam locomotives. The additional water was required when a heavier class of steam locomotive was introduced to the steep Adelaide Hills gradient. When diesel locomotives began to replace steam trains during the fifties the dam was no longer required by the railways. In 1960 the area adjacent to the railway cottage was converted to a camp site by the then Department of Community Welfare with transportable buildings from the Education Department and labour from the McNally Training Centre. The camp site was used up until the mid nineties by the Department for Family and Community Services as a holiday camp for disadvantaged children, families and community groups. Local residents can remember from this period the delight (usually expressed in Pitjantjatjara) of many groups of Aboriginal children from the arid outback areas of South Australia as they experienced the wonderful wetlands areas of Woorabinda; which was most fitting given that the aboriginal word ‘woorabinda’ is understood to mean ‘a wet place’. The property was offered for sale to the District Council of Stirling in July 1993. The Council agreed to take out a lease on the property in May 1994 and finalised the purchased in June 1995. This council initiative has had enthusiastic support from the Woorabinda Committee, Board and the Friends group, as well as the broader community. Kangaroos at Woorabinda. Photo courtesy Rob Tanner, 2012. 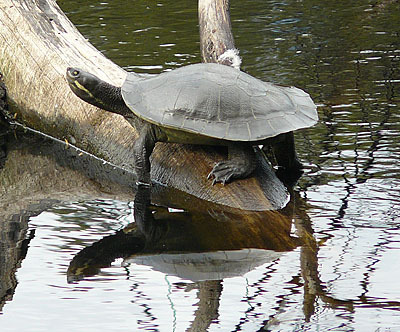 The lake is scenically attractive and together with its surrounding bushland provides a habitat for birds, fish, reptiles, animals and amphibians. 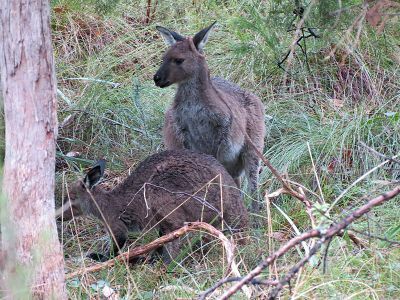 It also offers potential for a range of activities such as picnicking, bird-watching, other wildlife studies and just relaxing. (Swimming has been prohibited by Council for critical risk management purposes). All activities need sensitive control to prevent use by the public destroying the lake’s virtues. Already the recent increase in visitors to the lake is resulting in erosion and bushland destruction on the shore. A high priority for the Friends are programmes designed to reduce erosion and degradation of the lake edge. Protection of the reed beds is vital. Dogs swimming in the lake, chasing water birds and damaging the reeds and water weed are causing problems due to the large number of people with dogs using the park. Education, signage and restriction of access to some parts of the lake edge are necessary. All dogs within the park are required to be on leads. Woorabinda has become the focal point of educational activities within the Park with groups of Primary, Secondary and Tertiary students undertaking classes and individuals undertaking projects.